There is a time for action and a time for slow. Our vision quest will be ‘Tai Chi’ like in its pace, slow moving, thoughtful and expressive. The very purpose of our quest, to see with heightened awareness, gives us permission, to slow down and wander, like a stone pathway through a Zen garden. We can take all the time we need and in doing so, will discover hidden gems and treasure along the course of our journey. Wandering and wondering, contemplation and consideration, these are the keywords of our journey. It was purportedly the old Taoist sage Lao Tzu who said “Nature does not hurry, yet everything is accomplished. I think that’s a good motto for our vision quest. Two surfers pause. Are they looking at the waves, or...the amazing light? - Cox Bay, Vancouver Island. 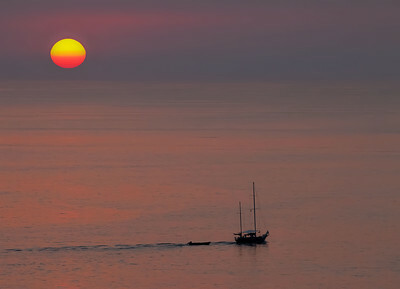 A slow sailboat in the setting sun. - Puerto Vallarta, Mexico.